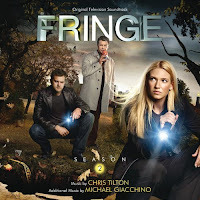 The soundtrack for Fringe Season 2 is now available. The original television soundtrack features 29 tracks of music composed by Chris Tilton and Oscar winning composer Michael Giacchino. Return to explore the boundaries of a mysterious mythology that holds millions of viewers in its hypnotic grasp. Season 2 of FRINGE contains worlds (and alternate worlds) of excitement complete with shape shifters, cryonic heads, belly-dwelling beasts and people who turn to ashes before our eyes. But the overarching narrative takes three clandestine FBI agents — Olivia Dunham, Peter Bishop and Walter Bishop — through a mind-bending investigation of a parallel reality that threatens to destroy ours. The impossible is here in a series that offers “the most satisfying, coherent story arc of any science fiction-flavored primetime drama” (Mike Hale, The New York Times). Composer Chris Tilton returns from Season 1 and delivers a mysterious, poignant and beautiful score.